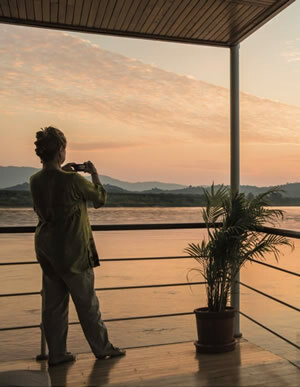 The Mekong river flows through six countries and on this section of the river three smaller Pandaw cruise ships cover from Vientiane in Laos to Jinghong in Yunnan, South-West China, stopping in Chiang Rai province of North Thailand and Keng Tung State in the Shan Hills of Burma. Highlights include the French colonial Laos capital of Vientiane, the temple city of Luang Prabang and the Menglun botanical gardens of Yunnan. We stop at several remote tribal villages to be warmly received and see local handicraft production and experience day to day rural life. But the most exciting part of any Upper Mekong river expedition must be the river cruise itself that passes through dramatic scenery with the river weaving through mountains and forests, gorges and rapids.